On March 22, Wilco guitarist Nels Cline became the latest high-profile musician to dig into some Free Library resources. Ray Banas, the Head of the Music Department and members of the Ars Nova Workshop arranged his visit. The purpose of this was to seek out the high-quality books, scores, and music resources to help power his latest project—Lovers (for Philadelphia)—featuring arrangements of classic Philadelphia and Philly-inspired songs. 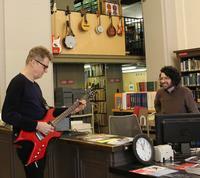 Our Music librarians are experts at handling questions from a variety of musical patrons. After all, this is the place John Coltrane used to visit to study when he was a student at Ornstein. We’re used to musicians from all across Philadelphia’s communities of music—from guitarists at Chris’s Jazz Cafe, to West Philly klezmer maestros checking out scores, books and instruments to power their performances. Librarians assembled resources relevant to our city’s rich musical tapestry, including books and scores on Philadelphia Soul, even Edwin A Fleisher orchestral works as well. Some of our librarian-fans made sure some of his material was on hand for autographs too! After we completed the research trip, Nels Cline surprised us with a serenade by performing solo on one of the circulating guitars & amps from the Musical Instrument Collection! Nels Cline’s Lovers (for Philadelphia—which will likely feature the sheet music and books inspired by his visit—will premiere on Saturday, June 2 at Union Transfer. 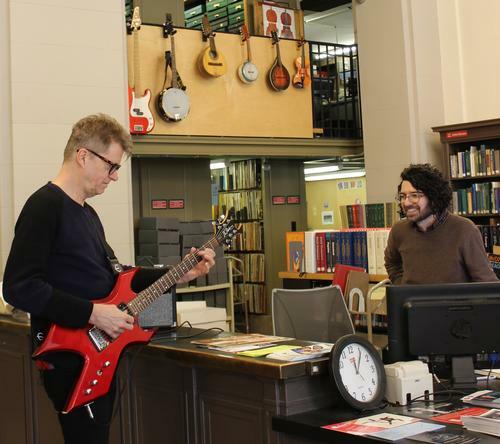 Music Department Librarian Perry Genovesi enjoying a personal concert from Nels Cline, as he plays one of the circulating guitars & amps from our Musical Instrument Collection. Nels Cline with Ray Banas, Head of the Music Department, and Mark Christman of Ars Nova. 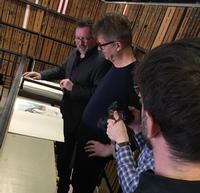 Nels Cline with Gary Galván, curator of the Fleisher Collection of Orchestral Music. 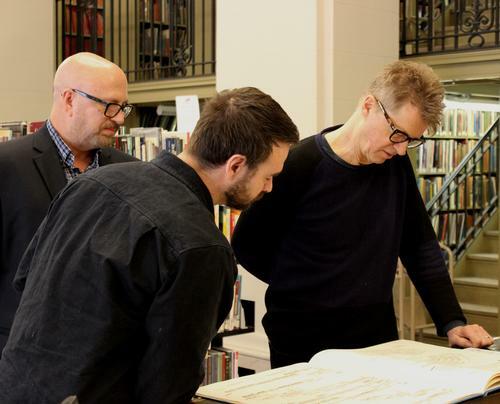 Add a Comment to Nels Cline from Wilco Visits the Music Department!